Replacement jockey Frankie Dettori had the Kevin Ryan-trained Emaraaty Ana out of the stalls smartly and led all the way over six furlongs to give the Hambleton Lodge handler a fourth Gimcrack triumph. Legends Of War made late gains on the leader, but was still half a length down on Emaraaty Ana (5-1) at the line. Shine So Bright was three-quarters of a length back in third. Aidan O’Brien’s The Irish Rover was out of the placings. Ryan said: “It’s great to win it again, that’s four times now. The son of Shamardal was given a 20-1 quote for the Qipco 2000 Guineas by RaceBets , and Ryan added: “He should get a mile next year so that makes you think about the Guineas. 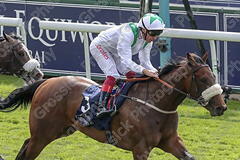 John Gosden said of Legends Of War: “He ran a lovely race. I couldn’t be more pleased with him. “He was nicely ridden. The winner was always too good for us, but I’m really, really happy. “To finish second in the Gimcrack is great and that (six furlongs) is his trip.